MELVILLE, NEW YORK, March 20, 2002 - FONAR Corporation (NASDAQ-FONR), The MRI Specialist, reports that the success of an accident victim's surgery and subsequent lawsuit rested entirely upon the results of his examination on the Stand-Up MRI™. The lawyer, Wesley Laird, of Laird, Baker & Blackstock, LLC, Attorneys at Law, Opp, Alabama, said, "I give all the credit for a successful settlement to the Stand-Up MRI™ because it found pathology that couldn't be found by other MRI scanners." Alabama resident Heath Kilcrease, a pain-stricken victim of a motor vehicle accident in 1998, had undergone exams on conventional "lie-down" MRI scanners as well as other diagnostic modalities, but none of them indicated that surgery was called for. But images from FONAR's Stand-Up MRI™ convinced Alabama surgeon John Hackman, M.D., otherwise. Mr. Kilcrease successfully underwent surgery in September, 2000. Later, Alabama trial lawyer Wesley Laird relied heavily on the same Stand-Up MRI™ images to reach a favorable out-of court settlement for Mr. Kilcrease. Mr. Laird said, "It is an honor to be the first attorney in history to be able to use FONAR's Stand-Up MRI™ in a personal injury case. What an opportunity this creates for trial lawyers to be able to help their clients." Following his accident in October, 1998, 23-year-old Heath Kilcrease suffered from severe unremitting low back pain. He required Class II narcotic pain medication to cope with his back and leg pain. After undergoing several exams on conventional, or recumbent, MRI scanners, including high-field units, specialists at two renowned academic centers (Emory and University of Alabama at Birmingham) agreed that the images showed only mild disc bulges, which provided no indication the patient could obtain relief from surgery. 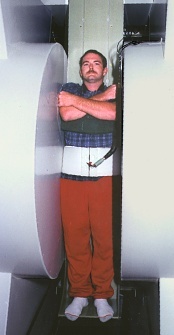 When he learned of the Stand-Up MRI™, Mr. Kilcrease went to FONAR headquarters in Melville, New York, in July, 2000, where he was scanned standing up. With the Stand-Up MRI™ images that indicated a disc herniation, Mr. Kilcrease went to John Hackman, M.D., a neurosurgeon in Montgomery, Alabama. "Because the weight-bearing scans from the Stand-Up MRI™ indicated pathology that was not previously visible, the medical plan for this patient changed dramatically," said Dr. Hackman. "It is highly significant that the weight-bearing MRI images showed the L4-5 disc protruding into the neural foramen, compressing the nerve against the bony walls of the canal. These findings directly correlated with the patient's complaints and documented his source of continuing pain." Using the images from the Stand-Up MRI™ to guide him, Dr. Hackman set out to confirm the results. "I ordered a myelogram and post myelogram CT just prior to surgery to see if we could verify the pathology the FONAR scanner had seen," said Dr. Hackman, "but what the Stand-Up MRI™ had visualized was not visible on either of them." Based solely on the Stand-Up MRI™ scans, Dr. Hackman successfully operated on Mr. Kilcrease in September, 2000. "The success of surgery was in large part due to the new powers of low back visualization that imaging of the fully weight-loaded spine enables," said Dr. Hackman. "Stand-Up MRI™ images were remarkably faithful to the actual pathology." Mr. Kilcrease's lawyer, Wesley Laird, said, "It's very difficult to settle out of court without firm evidence of damages and objective documentation. If a client has a physical problem that can't be properly documented, the defendant's lawyer and insurance company are naturally skeptical. The client is often labeled a malingerer. In Heath's case, the Stand-Up MRI™ made all the difference. Without it, the only choice would have been to go to trial and take our chances convincing a jury that Heath's back problems were worse than indicated by conventional, objective testing." Mr. Laird continued, "In a case like Heath's, the Stand-Up MRI™ can make the difference between a four or five figure settlement and a six figure settlement verdict. I plan on using the Stand-Up MRI™ whenever possible. If I get a client with undiagnosed symptoms, I'll be sending him to the closest Stand-Up MRI™, even if it means extensive traveling." Mr. Kilcrease is especially grateful to FONAR's Stand-Up MRI™, and to Dr. Hackman, Dr. Johnson and Mr. Laird for his successful outcome. "Before the surgery, I couldn't work and was constantly on pain pills," said Mr. Kilcrease. "Now I no longer take any pain medication and I have returned to work. I've returned to the life I had known, and I'm very grateful." Copyright© FONAR All rights reserved.